Bringing Home the Word is a lectionary-based, digital resource for individuals, families, and parish groups. The two-page digital format is accessible through your account dashboard and is designed to be easily printed and shared. You're able to cut and paste the articles and features to print or post in your parish bulletins, newsletters, website, and social media accounts. 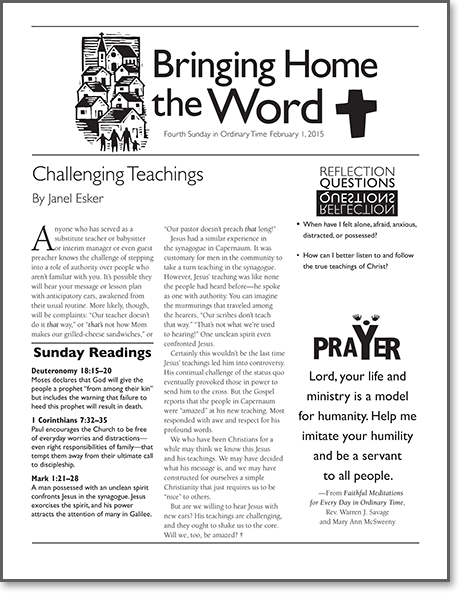 Each issue of Bringing Home the Word includes all content for every Sunday of that month. The readings for Sunday and the week following are provided for your reference. The main article relates the Sunday Gospel to our lives today. Two questions encourage personal reflection and group discussion. The short prayer can be used as a meeting opener, closer, or table blessing. Two articles, often under "The Home Church" column, offer thought-provoking and faith-filled insight as well as active suggestions for all Catholics and Christian families. Your subscription includes 12 issues/52 weeks which are made available monthly in flipbook format. Alll you need to do to access the latest issue is sign in to your account. Once you're signed in, you have the option to dowload a PDF file, print, copy, paste, and share the content wherever you'd like. Distribute copies to parishoners...send them in e-mail to Catechists...paste an article in your bulletin...post the readings and prayer...it's all up to you. Click here to sample Bringing Home the Word. For digital subscriptions including Bringing Home the Word, payment is due at time of purchase. If you have questions or need assitance, please contact customer service at 1-800-325-9521 or send an e-mail to subscriptions@liguori.org.